I’ve had off from work this week for the holidays, so I was really thinking this would be the week I’d get back into a solid running routine. However, the most poorly timed chest cold in history decided that wasn’t going to happen. Feeling slightly better this morning, I suited up for my first trail run with Jen K, of The Hungry Runner. Of course today has been the coldest day of the week, but at least it gave me a chance to put on my awesome new Under Armour running gloves. After a mile, my hands felt like they were in an oven, so the gloves work! We headed over to Forbidden Drive on the Wissahickon trail. It’s basically just a gravel road that runs next to the water, which makes for some pretty scenery. Good for starting out on trails, but I think we’ll try and find something a little more rugged down the line. The trail was a nice change of pace from the Kelly Drive route I’m used to. No cars and very few other runners. We also ran without headphones, which wasn’t quite as bad as I thought it would be. We stuck to a quick 3.5 miles. Jen’s a much faster runner than I am when it comes to short distances, but she slowed it down a bit so I could keep up. It was a little more difficult for me than it should’ve been since I had a hard time breathing due to my cold, but trail running seems like a new medium I can definitely tackle. I’m looking forward to checking out some trail races in the area… maybe when it warms up a little. When I started running a few years ago, it was mainly to get some exercise. I did a bunch of 5K’s, usually when they supported a cause I was vested in or if I had friends running them. I took my first leap into distance running with the Broad St run in 2010, a 10-miler across the city of Philadelphia. It’s an amazing race with 30,000 runners and thousands of spectators. After some training, I finished my first Broad St. It was at that time I first started to think that maybe I could do a marathon. I mentally added it to my bucket list. 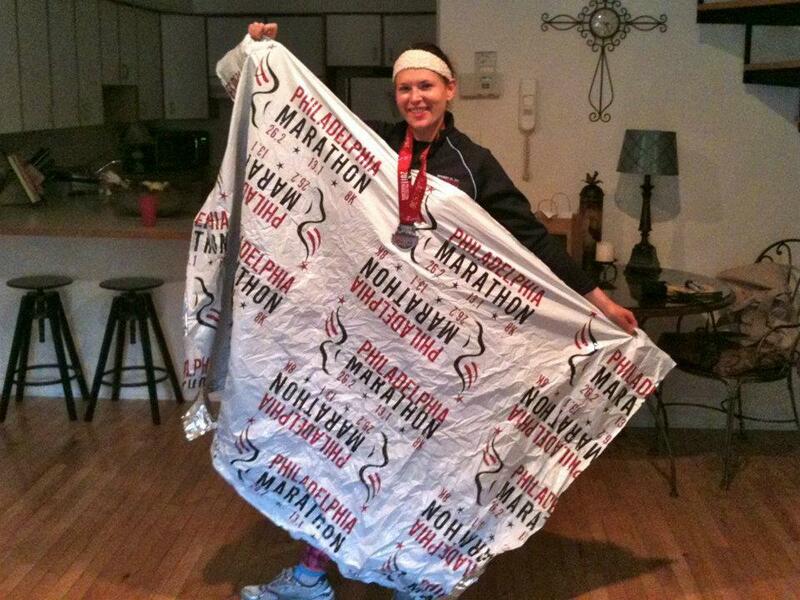 And this year, when registration opened for the 2011 Philly marathon, I decided to bite the bullet and sign up. I knew if I thought about it too much, I’d never do it. At the beginning of the summer, I embarked on actually learning about running and how to train. I became obsessed with my schedule and planning my runs, figuring out what to eat, reading every article on running I could get my hands on. And by the time the marathon came and went in November, I couldn’t imagine my life without all that training. It was in that mindset that I signed up for the Napa Valley Marathon. A month later, I kind of wish I had thought it over a little more. In theory, running the marathon in Napa sounds great. Run through some gorgeous scenic countryside, with lots of vineyards, in a pleasant climate. Take a little vacation in California while I’m out there. Visit some wineries. Not a bad way to recover post-race. Even the strict no-headphones rule (which I’ve learned they actually enforce) seemed like a fun challenge. But I forgot a few key things here. Firstly, Christmas, and the entire month of December is like a scheduling black hole where any free time you have is devoted to shopping, parties, drinking punch, and eating cookies like there’s no tomorrow. Certainly leaves no time for training. Secondly, it’s cold outside!!! Doing training runs in September was great. I looked forward to being outside. Now it’s all I can do to walk to the gym with multiple layers on, and it’s not even the peak of winter yet. Thirdly, there’s no daylight! It’s nearly impossible to run before or after work because there’s so little sunlight, and I’m not crazy about running in the dark. I find myself severely out of marathon shape, with Napa coming up on March 4. I need to get back on track, fast. I will be forcing myself to get out and do at least a 13-mile run this weekend. I always struggle when it comes to cooking for my family. It’s a good opportunity to try out a new recipe, but everyone is a picky eater, so it’s not the easiest thing to come up with a dessert that pleases everyone. Luckily, my new obsession with Pinterest helped me out this year. I was short on time, so I decided a pie would do the trick, rather than dealing with leveling, cooling, and icing a cake. 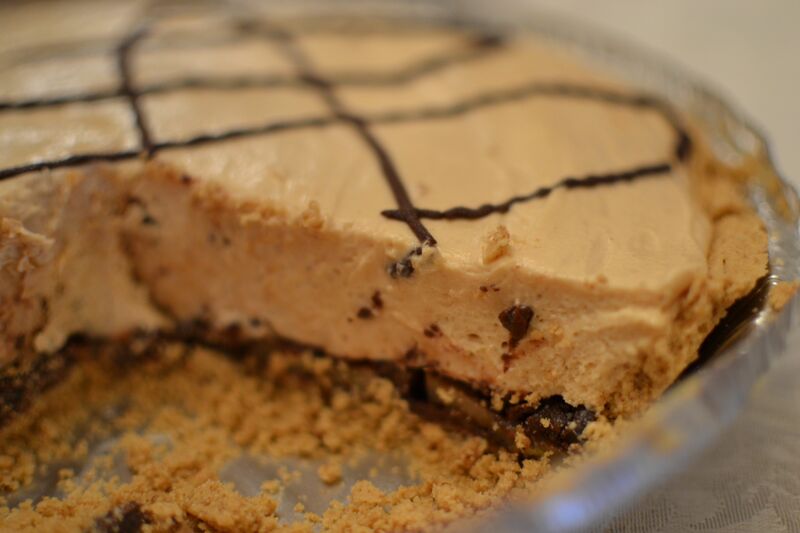 And when I came across a pin for chocolate peanut butter pie, I knew nobody could argue with that. 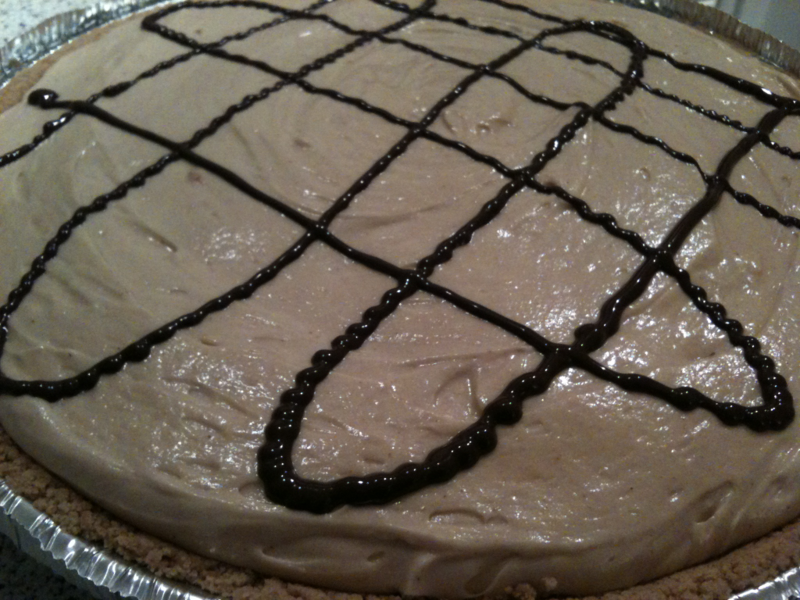 The peanut butter filling recipe came from In Jennie’s Kitchen, and it was absolutely perfect. Not too sweet. I actually used a pre-made graham cracker crust since I was short on time and patience after a long season of holiday baking. To make up for the lack of chocolate in the crust, I melted 1/3 cup of nutella and poured it over the crust. I added some bananas (which I roasted on a baking sheet to get a little bit of a caramelized flavor on them) on a single layer over the nutella. Happy eating! Pour the heavy cream into a bowl and beat using a stand mixer or hand mixer until stiff peaks form. Transfer to a small bowl and store in refrigerator until ready to use. Place the cream cheese and peanut butter in a deep bowl. Beat on medium speed until light and fluffy. Reduce speed to low and gradually beat in the confectioner’s sugar. Add the sweetened condensed milk, and vanilla extract. Increase speed to medium and beat until all the ingredients are combined and filling is smooth. Thanks for checking out my new blog. I know what you’re thinking…. ‘oh great, another food blog.’ Believe me, I had the same thought. But hopefully I’ll be able to keep it varied enough to make it interesting for both of us. My name is Jackie. I’m a 27-year-old Philly girl, born and raised in the suburbs, currently living in center city. I spend my days working for a publishing. Nights and weekends are reserved for running, eating, cooking, the Phillies, and quizzo. I am a lover of most things food-related. I cook for my friends and family whenever I get a chance. A few years ago, I got into cake decorating and baking, and opened my own cupcake catering business, Cupcake Karma. It was definitely a learning process. I learned that turning a hobby into a business can really take the fun out of it. So I have taken a step back to refocus and remember what I loved about it all. Somewhere along the line, I picked up running. Originally, I was just fed up with being overweight and running was the only way I could think of to shed some pounds. 80 pounds and a few years later, I can’t imagine my life without it. I completed my first marathon a month ago, and almost immediately after I finished, I signed up for the next. I look forward to sharing my race successes and failures, recipes, restaurant reviews, and other food/cupcake/running related tidbits with you all.